1) After choosing a color from the list, ColorManager can filter (reduce) your parts list to only those pieces that are available for sale (from Bricklink) in the color that you choose. a) Convert the colors from LDConfig.ldr, but keep the names that MLCAD uses. This will prevent MLCAD from writing code to your model that is not necessary. b) Convert the colors from LDConfig.ldr using the names in the file, which are nearly identical to the BrickLink names. 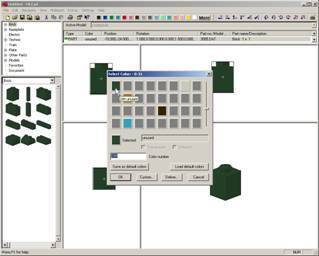 Choosing "Original MLCAD" will return the MLCAD color pallet back to the original colors (no update). Choosing "Virtual" from the list of colors will return your list of parts back to the original (no filtering). You should move the ColorManager folder to LDraw\Apps\ColorManager. Then open the config.txt file and verify the information inside. You should also move the LDConfig_custom.ldr to your LDraw folder. Look for language specific LDConfig files in the near future, or send me an email. the parts are available for purchase. Color Manager can help with that. 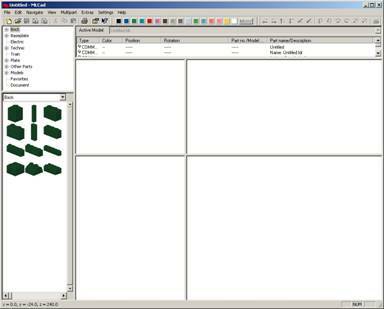 Select All_Real from the bottom of the list, click Write Parts.lst, and MLCAD should open with only parts that are available for sale on BrickLink; regardless of color. WARNING, this may take over 30 minutes to complete. 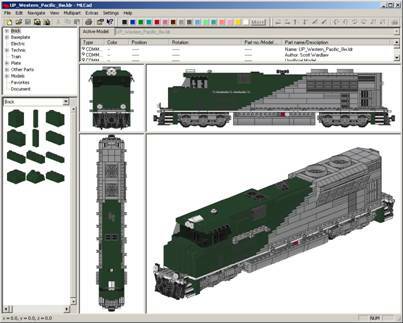 In all cases, Color Manager matches LDraw parts to BrickLink parts by part numbers. 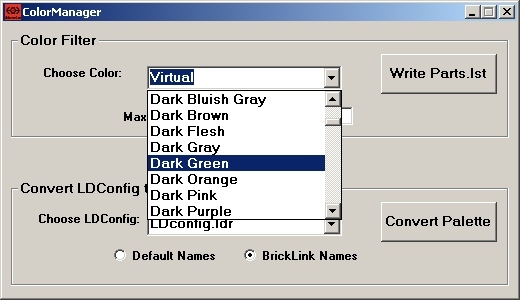 When parts become available for sale in new colors, you want that information, but you may not want Color Manager to download the BrickLink database all the time. You can adjust when Color Manager downloads new part availability by adjusting the Minimum File Age. Change it to 0 to download every time, or make it a large number, so you don’t have to wait on it. 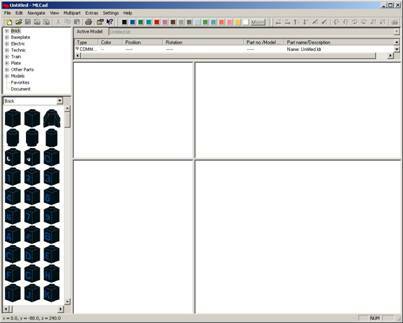 Color Manager can convert the official LDraw colors in LDconfig.ldr, to MLCAD.cfg. 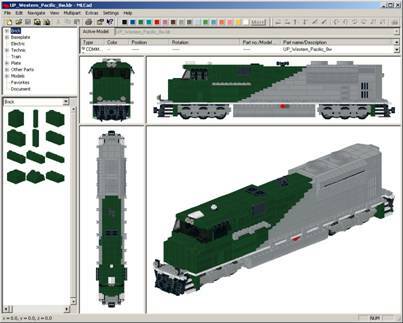 In other words, the colors in MLCAD can now be the colors that you can buy from BrickLink. If the config.txt file is set correctly, simply choose the LDConfig file in your language and click Convert Palette (close MLCAD first). If you would rather have more realistic-looking models in MLCAD, select the LDconfig_custom.ldr that comes with Color Manager. Feel free to make changes to this LDconfig_custom.ldr, but please don’t exceed 63 custom edge colors; including those already defined. Alright, so you want to go back to the dithered colors. 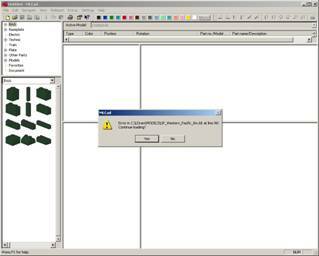 Just select Original MLCAD from the pull-down menu and click Convert Palette, or restore your MLCAD.cfg from LDraw/Apps/ColorManager/BACKUP/MLCAD.cfg. 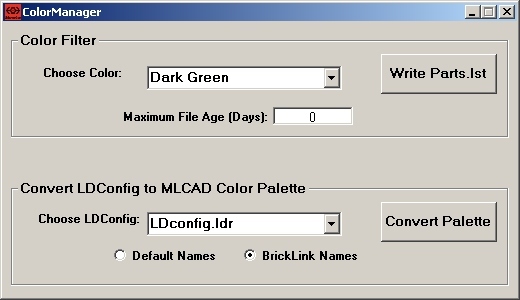 MLCAD is sensitive to changes in the color names. 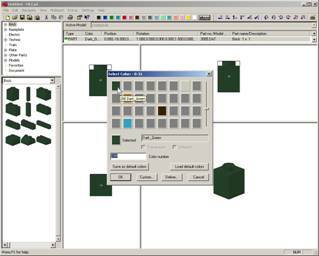 It was designed to let the user create colors that are saved to the model that you are working on. Color Manager gives you the option to use the official color names. Just select LDConfig Names and click Convert Palette. If you save any model with these LDConfig names, you will see this message. No harm done, but it’s your choice which route you want. UPDATE – in config.txt, CleanModels set to true will not cause MLCAD to give the message below when the model is opened with ColorManager. All text, images, or trademarks referenced here or in the software are the intellectual property of their respective owners. All content is provided as is, with no warranty stated or implied regarding the quality or accuracy of any part or functionality of the code, sample files, documentation, or executable program. 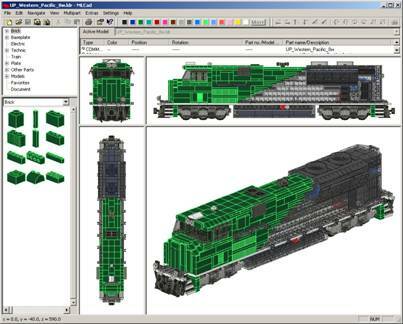 LEGO® is a trademark of the LEGO Company, which does not sponsor, authorize, or endorse this software.